Exceptional new restoration of classic French film enhances an already monumental work. At first glance, this film might seem like a poor candidate for greatness, or even relevance in our era. It’s over three hours long, French, in black and white, and occasionally features pantomime performances due to its early 19th century theater setting. Sounds pretty bad so far, right? Instead, Children of Paradise is an enthralling, transcendent, and absolutely essential masterpiece. Thanks to its exceptional and meticulous new restoration, it’s even better than ever now and fully worthy of a permanent place in your Blu-ray collection. The film is set in a Parisian theater district teeming with crowds for its offerings, ranging from the basest sideshow spectacles to highly esteemed plays. Falling somewhere in between is the Funambules Theatre, a ramshackle venue hosting pantomime performances. Key performers and patrons of the theaters meet and get involved, leading to one lady named Garance (Arletty) becoming the object of affection for four very different men. She starts the film as a sideshow performer but rises to a classy courtesan through the course of her relationships with these men. Her first benefactor is a notorious thief who admires her more for her thieving talent than her womanly charms. Her next conquest is the innocent and completely smitten Baptiste (Jean-Louis Barrault), the son of the Funambules owner who becomes the marquee pantomime star of the venue after meeting her. She settles for some emotionless romping with a hilarious actor named Lemaitre (Pierre Brasseur) before moving on to a loveless but financially rewarding relationship with an aristocrat. Through it all, true love blooms and sustains between Garance and Baptiste, even though situations and time conspire to keep them apart. While the plot is centered on Garance’s romantic and financial relationships, that sells the thrust of the film very short. In overall impact, she’s actually more of a tangential character in the orbit of the fascinating theater denizens. The film spends considerable time presenting theatrical performances, giving us shows within the show, primarily Baptiste’s stunningly enchanting pantomime performances but also Lemaitre’s completely uninhibited comedic takes on serious theatrical plays. This allows the actors to really shine and plays to their strengths, especially Barrault’s captivating mime work. I don’t like pantomime, but Barrault is spectacular here and possessed the ability to completely change your perception of the art form. All of the actors are extremely effective in their roles, setting up an acting showcase that is a delight to watch. The film’s creation was almost as thrilling as the film itself. It was made in the latter stages of WWII in Nazi-occupied France, with the production team basically in hiding in the south of France. The opulence that appeared on film was in stark contrast to the bleak socioeconomic conditions of the time that found the cast and crew constantly hungry due to lack of available supplies in the war-ravaged nation. Rampant paranoia ruled the era, with the cast and crew worried about being labeled as Nazi sympathizers or opponents, and co-star Arletty unable to even attend the premiere due to her political leanings. And yet, none of that strife appears on film, making its majestic triumph all the more amazing. The interior and exterior sets were huge and ornate, while the elaborate costume design further enforced the splendor of the film’s setting. Only by viewing the special features do we learn of the superhuman efforts needed to bring the film to screen. Those bonus features include two hour-long documentaries about the film, one produced by German TV in 1967 and the other in English from 2009. The earlier documentary is by far the better, as the crew tracked down all of the surviving principal actors and creators for their thoughts and perspectives on the film. The newer documentary relies too heavily on recycled extended scenes from the film and earlier interviews with the cast and creators, then leans on the insight of biographers and minor cast members for new material since the principals are no longer alive. Elsewhere, Terry Gilliam provides an introduction to the film and discusses its influence on his own directorial work, and a brief restoration featurette demonstrates the extreme makeover successfully given to the aging film last year. The restoration was performed by French studio Pathe, not Criterion, but it is absolutely pristine and all the more spectacular when compared side by side with the unrestored image in the featurette. The film was scanned from the original 1940s camera negative for all but a few scenes, ensuring the best possible source material for the restoration. The soundtrack is also exceptionally restored and appears in uncompressed monaural form on the Blu-ray. 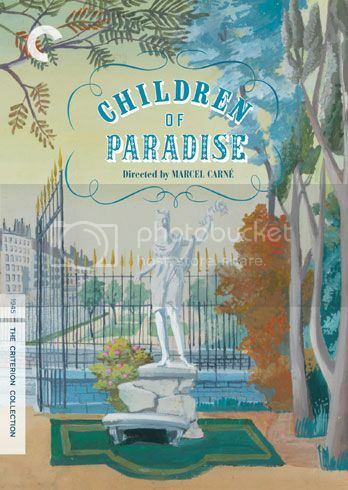 Children of Paradise is now available on Criterion Blu-ray and DVD. For more information, visit the Criterion website.